Seattle’s waterfront is a bustling commercial seaport, cruise line terminal, and a great place to visit. Spend a day enjoying part of what makes Seattle so special, its amazing waterfront. Seattle is often thought of as a high tech town, and that is certainly true with companies like Microsoft calling the area home, but Seattle’s downtown is dominated by the port. The Port of Seattle is called the Gateway to the Pacific Rim and the bright orange cranes that place that cargo aboard ships loom over the waterfront. For blocks the waterfront is dominated by cargo containers, trains tracks, and semis hauling goods to be shipped around the world. The port is also home to cruise lines that sail to Alaska from May to September. Every weekend cruise ships are lined up along the piers offloading and loading passengers and supplies for these voyages. As many as 140 ships call on Seattle during the season, creating a multimillion dollar industry. There is a major ferry terminal at the port serving commuters to Bainbridge Island and Bremerton as well as sites, shops and restaurants to entertain the entire family. Start the day at the north end at Bell Street and Pier 66. This is the location of the Odyssey Maritime Museum, which teaches about the port, commercial shipping and fishing, and the ecology of Puget Sound with displays and interactive exhibits. Kids will enjoy piloting a virtual kayak across the sound and navigating a ship. When you leave Pier 66 head south and check to see if any ships are in at the terminal for Norwegian and Celebrity cruise lines. If you’ve never seen one up close, these ships are massive and it’s really mind boggling to imagine how they are offloaded, cleaned and stocked in a matter of days for the next cruise. Next stop, Pier 59 and the Seattle Aquarium. The aquarium has a number of different exhibits such as a 25,000 gallon coral reef and the ever popular seals and sea otters. There are hands on exhibits where you can touch animals like sea stars and walkways with underwater views of the sea life. Don’t miss the giant octopus or the sixgill sharks. You can take a beverage break at the café and do a little browsing at the gift shop. Continue south to Pier 57 and the Bay Pavilion. Inside you will find shops like Pirate’s Plunder with all things pirate related, and the Sports Den featuring Seattle and other major league sportswear. Head all the way to the end of the pier and there is a beautiful indoor carousel and for further family fun, an arcade. Argosy Cruises, offering a number of Seattle cruising options, is at Pier 56. Take a one hour narrated cruise of the Elliot Bay which departs every hour in the summer. Relax and enjoy seeing and hearing about the Cascade and Olympic mountain ranges, the Seattle skyline, and the shipping terminal. Snacks and drinks are available onboard. At Pier 55 stop in Simply Seattle for fine quality Seattle gifts. You can buy smoked salmon, books, sports gear, chocolates, and order gift baskets to send to family and friends. Hungry? 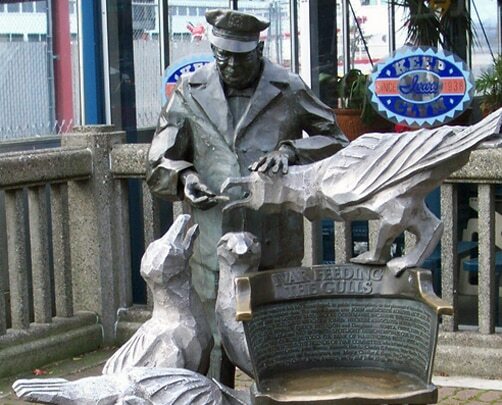 Ivar’s Acres of Clams is located at Pier 54 and is a Seattle tradition for fresh seafood. Ivar’s features their famous fish and chips, clams, salmon, halibut, and chowder. Ivar’s has a complete bar, a kid’s menu, and seating overlooks the water, so relax and enjoy the food and the view of the bay and the mountains. Finally wander down to Pier 52 and visit the Washington State Ferry Terminal. Washington has the largest ferry system in the U.S. and covers eight counties and British Columbia. Some inhabited islands in the Seattle area are only accessible by boat and the ferries serve commuters daily. Seattle’s waterfront serves many industries in the area including shipping, fishing, and tourism. There is much to see and learn and certainly a lot of fun to be found. Bring the family and spend the day. Getting There: The waterfront is located along Alaskan Way and easily accessed by car, bus or, in the summer, the waterfront trolley. Parking is available on the street and under the Alaskan Way Viaduct. Take any downtown exit from I-5 or Hwy 99 and head toward the water.